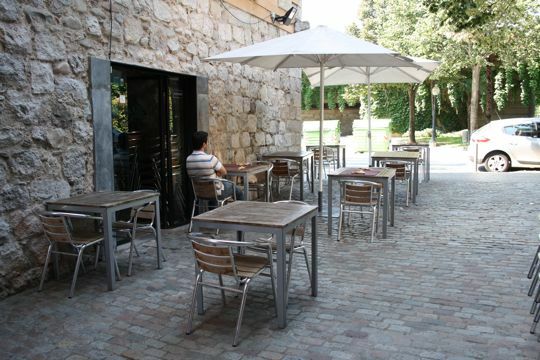 La Vedette, the perfect choice in Girona. 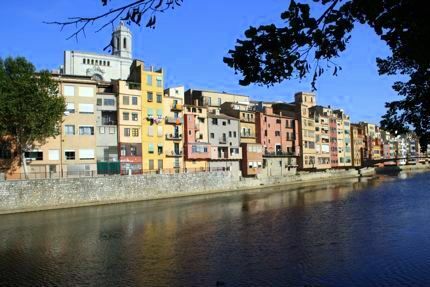 When Ale and I arrived in lovely Girona (also called Gerona in English) we were starving. Luckily, we’d had a half hour bus ride (plus a 45 minute wait) from the Girona Airport to our hotel to figure out exactly where we would go. Looking back, we probably should have checked out the cheap car rentals at Gerona airport. There are so many places to go in Costa Brava that you really need a car to get to, but we had opted not to rent this time, since we’d be on the blogger bus. Our stomachs rumbling, we scoured our options on Tripadvisor and Yelp, and I noticed a recurring theme in Girona, restaurants serving crepes! It really isn’t surprising that Girona is home to some very good crepe restaurants, as it is only a 45 minute drive to the French border. But I was still curious, as I have never found a decent crepe restaurant in any other part of Spain. 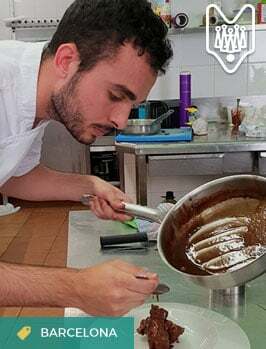 Intrigued, and knowing that we would have plenty of Catalan specialties over the following week, we decided to try La Vedette, a centrally located crepe restaurant in Girona. 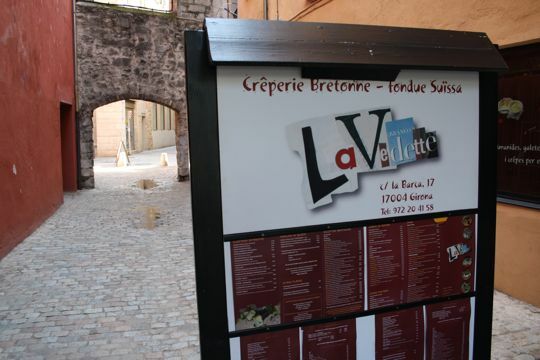 If you are wondering where to eat in Girona I would definitely recommend trying lunch at La Vedette! After quickly checking into our hotel, we walked over to the restaurant. It was pretty empty, given that it was only 1:00, but that meant we had our choice of tables. We decided to sit on their small and charming terrace, although the inside of the restaurant was cozy as well. 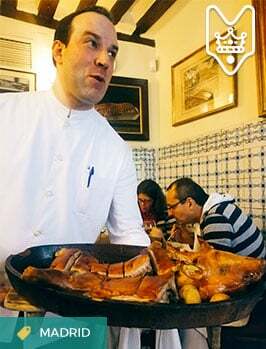 There was no debate about what to order, as the menu of the day was an absolute steal at 9,80€! It included a drink, appetizer, entreé, and dessert or coffee. 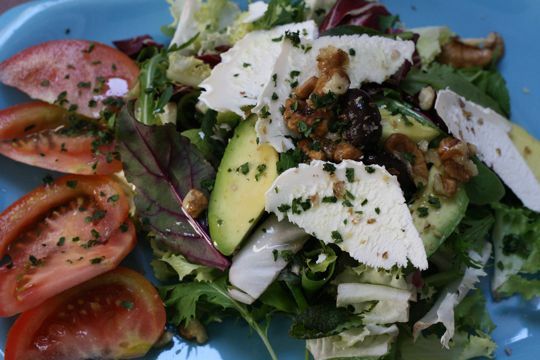 One of the best deals in town, lunch at La Vedette! 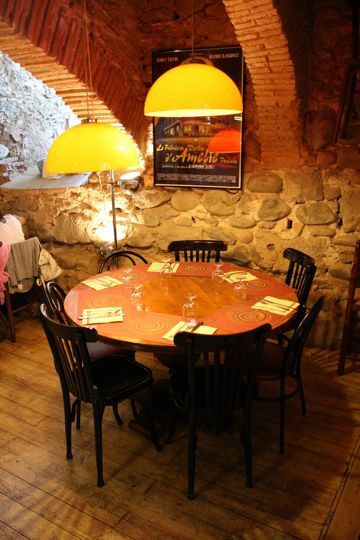 The cozy interior of La Vedette. We opted for lunch on the terrace! We started our meal on a healthy and wholesome note. Ale opted for the cream of pumpkin soup with toasted almonds on top. It was delicious and I was pretty envious until I got a look at my own salad, topped with ripe avocado, creamy goat cheese, and walnuts. It had been a long time since eating such a delicious salad out in a restaurant, and it was so delicious that I would’ve been content to eat another of their salads as the main course. 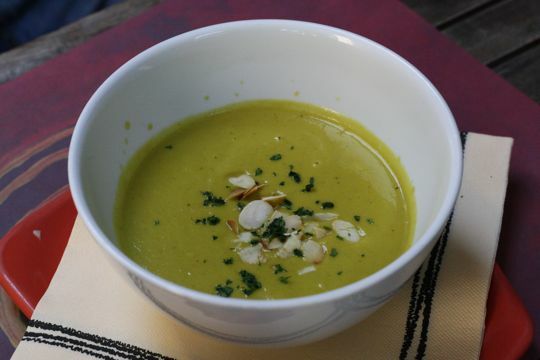 Cream of pumpkin soup with toasted almonds. My incredible salad at La Vedette. 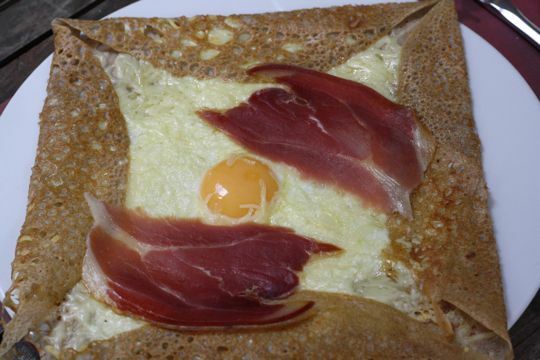 But of course I didn’t, opting instead for a delicious galette, a savory crepe stuffed with cheese, Serrano ham, and an egg. It was enormous and really good, but Ale’s choice was even better. He’d decided on a crepe topped with thinly sliced Catalan morcilla (blood sausage) and apple compote. It was a surprisingly perfect combination, and I found myself trading bites with him throughout the meal. Ham, egg, and cheese crepe– yum! 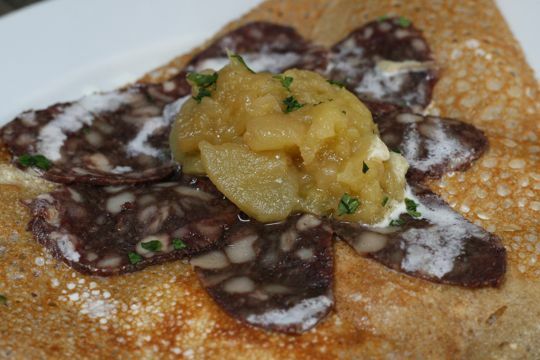 A crepe with morcilla and apple compote. We were already stuffed, but I was eager to try something sweet. 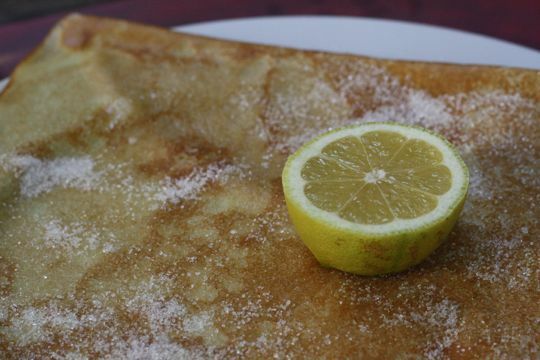 I ordered a crepe with sugar and lemon, which was very good, but lacked that special punch. Ale lucked out (again) with his incredibly fresh yogurt with blueberry jam. I’m slowly becoming a “yogurt is a dessert” convert (shh don’t tell anyone!). A simple lemon crepe for dessert. 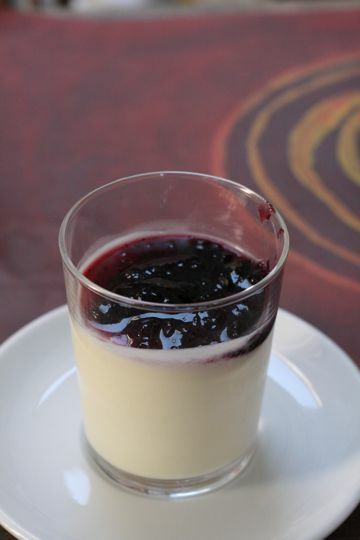 Delicious yogurt with jam… is it a dessert? 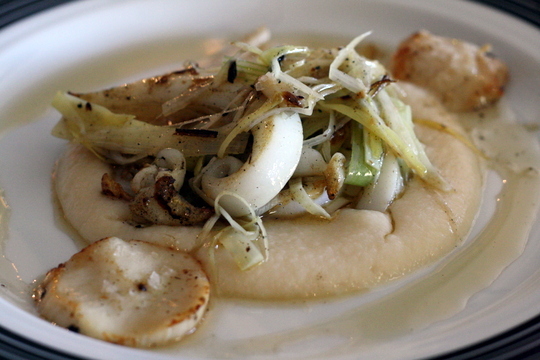 Overall, La Vedette was a truly perfect place to eat in Girona. We really enjoyed our fresh meal, their lovely terrace, and friendly service. 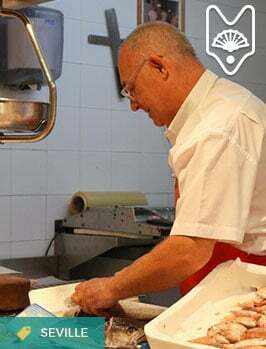 Next time you’re in Girona, give it a try! 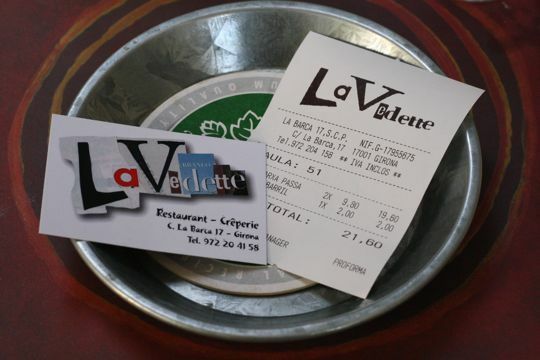 Your wallet will thank you at Girona’s La Vedette! If you are planning to visit Gerona, you should definitely check out Holiday Autos care hire offers. If we hadn’t been on the blogtrip, we would have definitely rented a car– if you don’t you’ll miss so much! Selected cars and bookings made before November 30, 2012 are even available for up to 20% off, and there is always a new deal to be found. 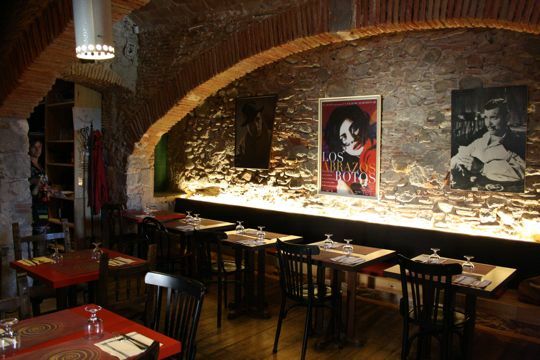 Would you try a crepe in Girona? 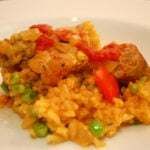 Do you ever stray from the local cuisine while traveling? So, every single dish looks delish! I was taken back by the price until I realized everything that’s included. It is a steal. 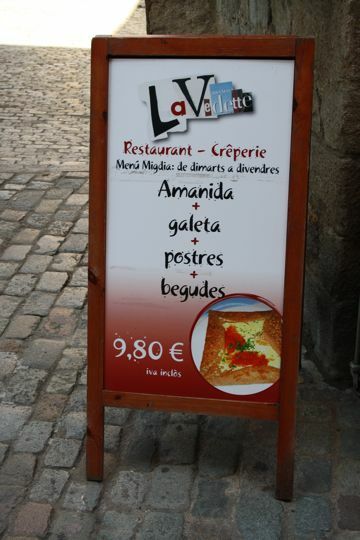 I don’t foresee a trip to Girona in my very near future (like now); wonder if I could replicate that crepe at home. 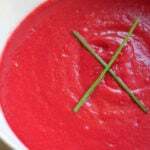 Off to search YouTube recipes! Great piece and the food sounds fantastic. I have never been to Girona(just changed buses there once)and I have only heard very good things about the food there. I will have to get up there! Thanks for the info Lauren! Paddy, you have to get over there! The city was great and it makes an incredible base for exploring the region. I know you would love everything!